Cleaning larger glass aquariums can be difficult without the right tools. 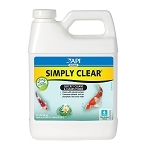 Our 22 inch glass surface scrubber can reach to the bottom in larger aquariums and the angled head shape has scrubbing surfaces on all sides to reach into the smallest areas. The sure-grip no-flex rubber handle is easy to grip with gloves or bare hands for easy and precise control of the scrubber. Always test on a small surface of the tank just to make sure it does not scratch. Rinse thoroughly after each use to remove any embedded gravel particles or algae. Do not use with any type of soap or detergent. These scrubbers are great for cleaning any plastic surfaces and equipment used by your other household pets.